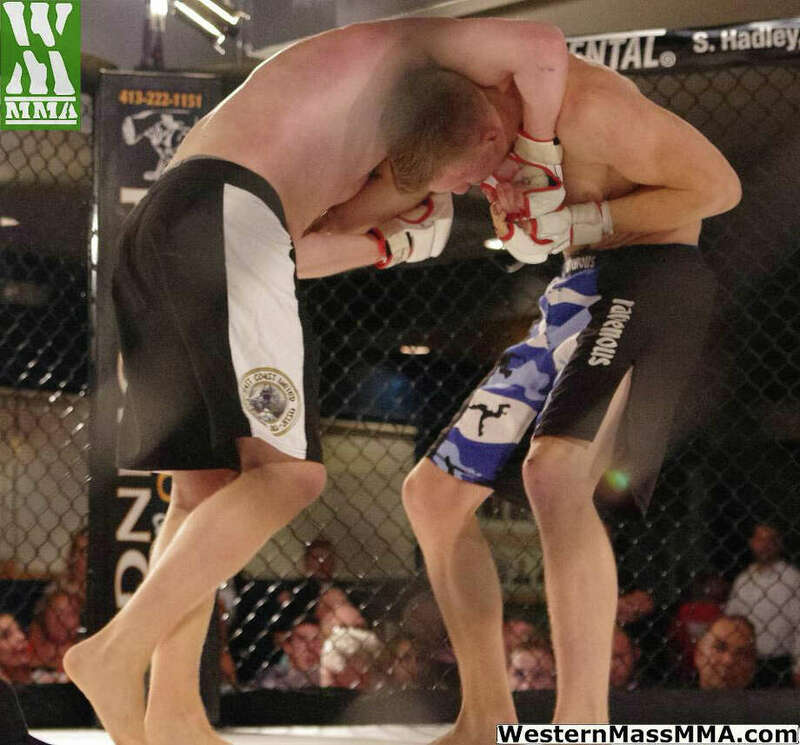 Fairfield-native Curtis Watkins, pictured, fought his first MMA fight Friday night in Chicopee, Mass. Joe Oppedisano and Tony Florio both think Curtis Watkins could be a professional mixed martial arts fighter. The East Coast United School instructors believe Watkins -- the former wrestler at Fairfield Warde and rising senior wrestler at Ursinus College in Collegeville, Pa. -- has the work ethic, strength and tactical ability to rise the ranks in MMA. "He could be a well accomplished pro," Florio said. "He's a tough, gritty kid. His work ethic is unparalleled ... and if he develops ... there's no reason he won't be on one of the top pro circuits in the next five to eight years." Despite falling via submission to Zach Ordoyne in his first bout Friday at the Hu Ke Lau Showroom in Chicopee, Mass., Watkins surpassed all his teacher's expectations. "For his first fight, I was impressed," Oppedisano, who also owns the school, said. "To step in the cage and overcome the nerves and fear ... is amazing." Oppedisano and Florio coach Watkins at ECU -- based in Fairfield's SportsPlex -- and have been impressed with his work ethic. Watkins was the 135-pound Connecticut state high school champion in 2009 for Warde; and his success and pedigree working for Mustangs' wrestling coach Jason Shaughnessy, were too much for Oppedisano to ignore. "The caliber of wrestler Shaughnessy provides is a different caliber," Oppedisano said. "His kids have the ability to adapt to MMA. It's easy to coach (Watkins)." Watkins has quickly moved up the ranks at ECU, and was bold enough to ask Oppedisano for a MMA fight, the first such fighter from ECU. Oppedisano offered the Fairfielder the option, as long as he was willing to work. "He came to us and said he wanted to fight MMA," Oppedisano said. "I told him, `you have to be here every single day and if you don't, you can't compete.'" Watkins did not let his coach down, despite a hand injury that kept him from combat for six weeks. Oppedisano kept his end of the deal, scheduling the 21-year-old for a fight Friday against Ordoyne. Inspired by the atmosphere -- plus the adrenaline rush of being confined in the cage with Ordoyne -- Watkins took the opening round and Oppedisano deemed his second round impressive too. "I thought he won the first two rounds," Oppedisano said. But Watkins got trapped by Ordoyne's third-round armbar and the official stopped the fight. Amateur officials, according to Florio, take more precaution than UFC refs and ended the bout. "I thought I did well," Watkins said. "I think it was great." Despite falling, the experience affirmed Watkins' love for fighting. "I felt alive," he said. "I felt like this is where it is fun and where everything pays off." Florio was quick to point out Watkins' weakness in stand up positions, but thinks with time and more fights that could be amended. "For a lot of wrestlers, especially accomplished ones, grappling on the ground develops quickly," Florio said. "That stand up aspect he's not used to ... He's only 21, and pretty much the sky's the limit for him." But in the mean time, Watkins is more concerned with Ursinus wrestling and finishing his senior season. "My focus is wrestling," Watkins said. "Hopefully wrestling to nationals and a national championship, if that's in the cards." Oppedisano is concerned about that too, but assured Watkins that if he finishes school, there'll be more MMA at home. "He needs to put in the time for wrestling and going to school," Oppedisano said. "But there absolutely will be one fight for him next summer, maybe two."